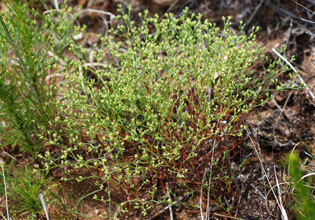 Stems: Erect, much-branched above, rough or minutely pubescent, sometimes glabrescent; nodes sometimes swollen. Leaves: Opposite, basal and cauline, basal often withering early; stipules lanceolate, .2 to .6 inch, membranous; petiole sometimes present on basal leaves, usually absent on cauline leaves; blade linear, .3 to 1.2 inch long, less than 1/25 inch wide, tip obtuse to acute or mucronate, margins entire, surfaces puberulent to pubescent. Inflorescences: Cymes, terminal, 20-70-flowered, uppermost flowers often in 3s. Flowers: Sepals 5, slightly connate basally, forming short tube, lobes lanceolate, 1/16 to 1/10 inch, margins membranous, apex acuminate; petals 5, thread-like; stamens 5; styles 2. Fruits: Utricles, ellipsoid to ovoid, ca. 1/25 inch, smooth; seeds brown or reddish brown, nearly spherical to ellipsoid. Uses: The Kiowa brewed a tea-like beverage from the plant. Comments: Named for Edwin James, botanist and geologist with Stephen Long's expedition of 1819-1820. Paronychia, beside and fingernail, alluding to its use for treating diseases of the fingernail.